Research - Vivek N. Prakash, Ph.D. 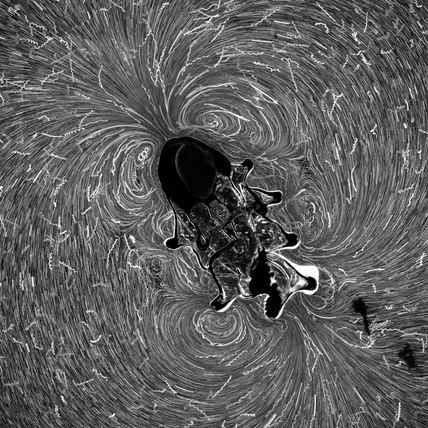 Here, we study the ciliary bands of starfish larvae, and discover a beautiful pattern of slowly-evolving vortices that surrounds the swimming animals. Quantitative experiments and modeling demonstrate that these vortices create a physical tradeoff between feeding and swimming in heterogenous environments, which manifests as distinct flow patterns or "eigenstrokes" representing each behavior---potentially implicating neuronal control of cilia. This quantitative interplay between larval form and hydrodynamic function generalizes to other invertebrates, and illustrates the potential effects of active boundary conditions in other biological systems. We conduct experiments in a turbulent bubbly flow to study the nature of the transition between the classical -5/3 energy spectrum scaling for a single-phase turbulent flow and the -3 scaling for a swarm of bubbles rising in a quiescent liquid and of bubble- dominated turbulence. The energy spectra are found to follow the -3 scaling at length scales smaller than the size of the bubbles for bubbly flows. This -3 spectrum scaling holds not only in the well-established case of pseudoturbulence, but surprisingly in all cases where bubbles are present in the system (b > 0). Therefore, it is a generic feature of turbulent bubbly flows. Particles suspended in turbulent flows are affected by the turbulence and at the same time act back on the flow. The resulting coupling can give rise to rich variability in their dynamics. Here we report experimental results from an investigation of finite-sized buoyant spheres in turbulence. We find that even a marginal reduction in the particle’s density from that of the fluid can result in strong modification of its dynamics. We find that the particle acceleration variance increases with size. We trace this reversed trend back to the growing contribution from wake-induced forces, unaccounted for in current particle models in turbulence. Our findings highlight the need for improved multiphysics based models that account for particle wake effects for a faithful representation of buoyant sphere dynamics in turbulence. We report results of the first systematic Lagrangian experimental investigation in a previously unexplored regime of very light (air bubbles in water) and large (D/eta) particles in turbulence. Using a traversing camera setup and particle tracking, we study the Lagrangian acceleration statistics of 3mm diameter (D) bubbles in a water tunnel with nearly homogeneous and isotropic turbulence generated by an active grid. The experiments reveal that gravity increases the acceleration variance and reduces the intermittency of the probability density function (PDF) in the vertical direction. Moreover, the experimental acceleration PDF shows a substantial reduction of intermittency at growing size ratios, in contrast with neutrally buoyant or heavy particles. We study the Lagrangian velocity and acceleration statistics of light particles (microbubbles in water) in homogeneous isotropic turbulence. Micro-bubbles with a diameter of 340 μm are dispersed in a turbulent water tunnel operated at Taylor-Reynolds numbers (Reλ) ranging from 160 to 265. We reconstruct the bubble trajectories by employing 3D Lagrangian particle tracking experiments. It is found that the probability density functions (PDFs) of microbubble acceleration show a highly non-Gaussian behavior with flatness values in the range 23 to 30. These acceleration PDFs show a higher intermittency compared to tracers and heavy particles in wind tunnel experiments. A 3D Voronoi analysis is used to quantify the clustering of inertial particles in homogeneous isotropic turbulence using data sets from numerics in the point particle limit and one experimental data set. We study the clustering behaviour at different density ratios, particle response times and Reynolds numbers. The p.d.f.s of the Voronoi cell volumes of light and heavy particles show different behaviour from that of randomly distributed particles, i.e. fluid tracers, implying that clustering is present. Light particles show maximum clustering for St around 1–2 for both Reynolds numbers. The Lagrangian temporal autocorrelation function of Voronoi volumes shows that the clustering of light particles lasts much longer than that of heavy or neutrally buoyant particles. 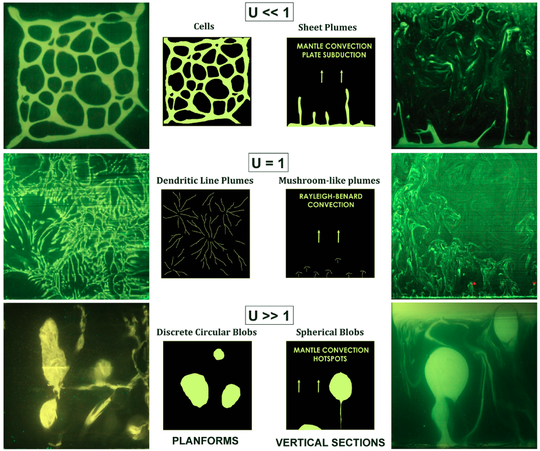 We investigate the clustering morphology of a swarm of freely rising deformable bubbles. A 3D Voronoi analysis enables us to distinguish quantitatively between two typical preferential clustering configurations: a regular lattice arrangement and irregular clustering. The bubble data are obtained from DNS using the front-tracking method. It is found that the bubble deformation, represented by the aspect ratio , plays a significant role in determining which type of clustering is realized: nearly spherical bubbles form a regular lattice arrangement, while more deformed bubbles show irregular clustering. We have conducted laboratory experiments to model important aspects of mantle convection. We focus on the role of the viscosity ratio, U (between the ambient fluid and the plume fluid) in determining the plume structure and dynamics. In our experiments, we are able to capture geophysical convection regimes relevant to mantle convection both for hot spots (when U > 1) and plate subduction (when U < 1) regimes. The LIF technique is used for flow visualization and characterizing the plume structures. The convection is driven by compositional buoyancy generated by the perfusion of lighter fluid across a permeable mesh. (C) 2016 Vivek N. Prakash. All Rights Reserved.